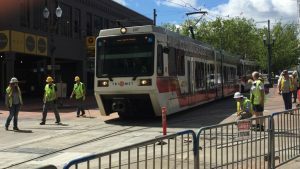 MAX Blue, Green and Red lines returned to regular routes in Portland City Center, and trains returned to regular schedule throughout the light rail system, on Sunday, May 21 following TriMet’s Morrison-Yamhill MAX Improvements project. Crews spent the past three weeks making track, switch, signal and intersection improvements on SW Morrison and Yamhill streets at 11th and 1st avenues. The project will help us keep the MAX system moving and has created a smoother ride for our customers as well as a smoother crossing for pedestrians, bicyclists and auto drivers. The improvements were done on some of the oldest sections of the MAX system that has been in service for more than 30 years. The switches and special track work at Southwest 11th Avenue connect to what was originally the end of the first ever MAX line, which went into service in 1986. Crews removed old wooden ties in the 11th Avenue area, put in more durable materials, installed new switch machines and track, improved drainage under the switches and updated cable for the signal system. At 1st Avenue, they installed new curved rail on Yamhill and Morrison streets. Crews also replaced broken asphalt, brick and Belgium Block around the rails at both 11th and 1st avenues. The Morrison-Yamhill MAX Improvements, plus two projects last year along 1st Avenue and at Rose Quarter reflect TriMet’s reinvestment into the MAX system to increase the resiliency of the system and keep trains running on time. We thank riders for their patience and understanding as we completed these necessary and important upgrades. TriMet coordinated with Multnomah County, Portland Bureau of Environmental Service and Portland Parks and Recreation to align sewer and other infrastructure repairs to occur during our Morrison-Yamhill MAX Improvements project. This avoided additional disruptions to MAX service in downtown and is just one example of how local agencies are working together to lessen the impact during what will be a very busy construction season. Learn more at movePDX.net.